Those are a few of the Valentino/Oscar moments everyone knows. But Mr. Valentino’s gowns have made many less famous, if equally memorable, appearances at the Awards. In 1981, for instance, Jane Fonda accepted the Best Actor prize for her father, Henry, in the same beaded Valentino haute couture gown modeled by Brooke Shields in the campaign. Jessica Lange wore Valentino when she won for Tootsie, and in 1992, Mr. Valentino clothed Best Supporting Actress winner Mercedes Ruehl, as well as Jessica Tandy, his dear friend Elizabeth Taylor, and Susan Sarandon, for whom he designed a beaded black velvet maternity gown. Other actresses who have worn Valentino to the Oscars include Jennifer Garner, Ashley Judd, Nicole Kidman and Kate Winslet. There are two more Valentino/Oscar moments that really do standout. In 1991, Sophia Loren—fellow Italian, icon and member of the extended Valentino tribe—wore Valentino when she collected her well-deserved Lifetime Achievement Award. And twenty years later, in what may well be the most Valentino of Valentino moments, Anne Hathaway donned an haute couture gown from the Fall/Winter 2002 collection. Valentino red, and detailed with Valentino-signature roses, and worn by an actress considered “like a daughter” by Mr. Valentino, the gown was a triumph. 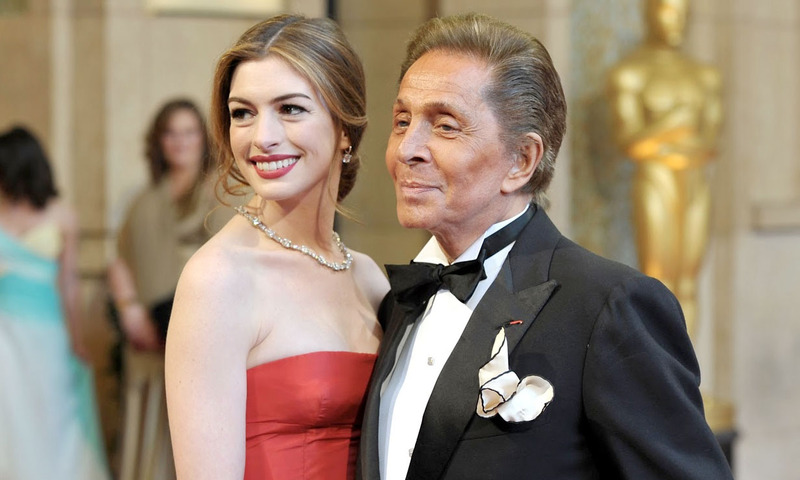 It came with a pretty stylish accessory, too: Hathaway was joined on the red carpet by Mr. Valentino himself.